Quentin Road: The road will be widened from two lanes to five lanes near Lake Zurich. Millburn Bypass: LCDOT is funding this long awaited IDOT project which will realign US 45 to remove the two t-intersections and major bottleneck. Old McHenry Road: Intersection improvement, pavement reconstruction and drainage improvements in Long Grove. Work will also continue on the Cedar Lake Road Project in Round Lake. Project Website Email Updates. LCDOT is reconstructing and widening the road, adding a center turn lane, and adding a new multi-use path with connection to the Forest Preserve. A large culvert replacement was completed in 2017 in advance of the roadwork that will be taking place this year. Another capacity project scheduled to begin later in the year (or early 2019) is Weiland Road from Lake Cook Road to Deerfield Parkway in Buffalo Grove. This is a reconstruction and widening project which includes a sidewalk and a new multi-use path. In recent years, LCDOT has more aggressively pursued repairs and replacements of old metal culverts with concrete pipe or new linings where possible. Heavy rain events have caused culverts to deteriorate faster than anticipated, making this a more urgent priority. 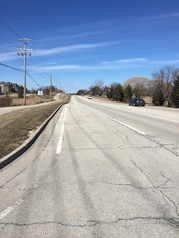 This year motorists will encounter culvert replacements on Kenosha Road in Zion, Gilmer Road in Hawthorn Woods, and on Rollins Road between Wilson Road and Fairfield Road. Preservation work to be completed in 2018 includes eight new pavement resurfacing projects. Resurfacing a roadway typically takes about three months to complete and usually requires lane closures and flaggers to direct traffic. Whenever possible bike-friendly shoulders are added during resurfacing projects. Construction zone speed limits are in effect AT ALL TIMES, not just when workers are present. Drivers should always slow down as they approach a work zone to watch for changing traffic patterns, equipment entering and leaving the work zone, and the men and women working on these projects. Lake County Division of Transportation Director Shane Schneider asked motorists to, "Join us and commit to roadway safety. As a road user, whether you are in a vehicle, on a bike, or walking or running along the sidewalk or bike path, there are decisions you make and actions you take that have an impact on the safety of everyone around you. Put down your phone, limit distractions, and remember we are all in this together. We all want to get home safely at the end of the day." BE IN THE KNOW - Connect with LCDOT! 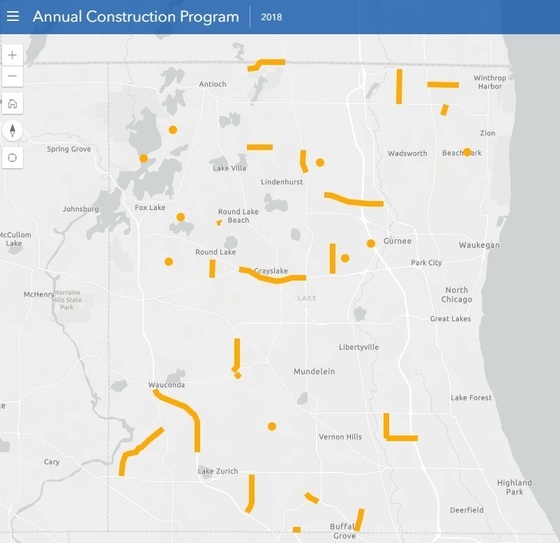 Interactive Construction Map: Residents can use our interactive construction map to find the project they're interested in, click on the project and see the latest information and important updates. Lake County PASSAGE: We're using technology like never before to help residents get where they're going and improve transparency. We continue to expand our PASSAGE system providing real-time, local traffic info on www.lakecountypassage.com, email traffic alerts, twitter alerts and PASSAGE smartphone apps. Social Media: Get the latest information, important updates, and take a peek behind the scenes to see the LCDOT in action by connecting with us on Facebook, Instagram and Twitter. Email Notifications: Enter your email, and visit our list of topics. Scroll down to sign up for General Transportation notifications or information about road closures, bike paths, specific projects and MORE.